Starcraft’s newest Crossover model maximizes passenger space in an edgy EXT package. A crossover, in the automotive world, is a vehicle that sits squarely in between an SUV and a car. Starcraft’s use of the term has more to do with a boat’s multiple capabilities, from entertaining to skiing to fishing to just hanging out at anchor. The first thing you notice on the new SCX 230 OB EXT is its twin-tier swim platform. One level is a standard integrated platform that works well for sterndrive applications but usually gets cleaved on outboard installs, seriously reducing its available passenger real estate. That’s not a problem here, because there’s a second, optional swim platform that sits very low to the water and curves up at the rear to provide a motor mount for a Yamaha F250. A closer look reveals it’s actually an Armstrong bracket, but instead of the one Starcraft has used in the past that’s just wide enough to mount the engine on, this one is nearly as wide as the upper platform. 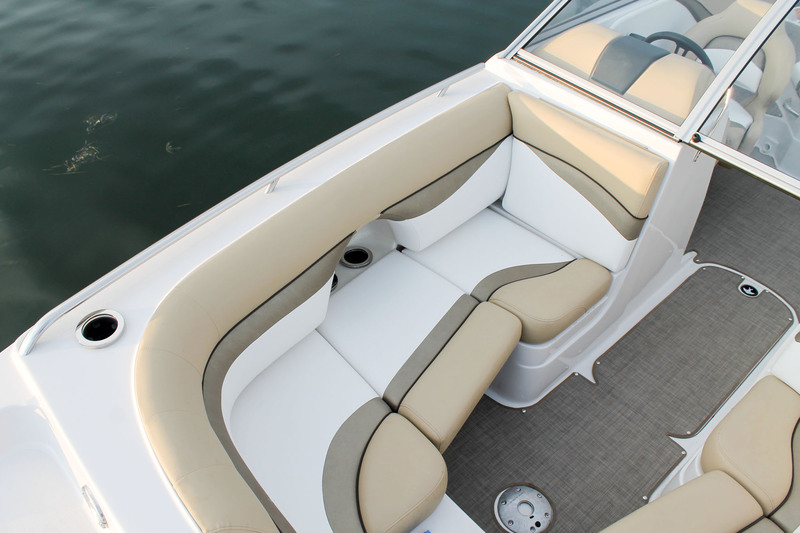 Not only does the arrangement provide easier access to the water, but it adds more passenger acreage when the engine is turned off. Now, passengers can sit on the stern on the rear-facing couch and on the regular platform with their feet on the bracket, or they can get down lower and chill with their legs in the water. In other words, there’s a place for the whole gang on the back porch. Both platforms are padded with SeaDek for comfort and provide an excellent nonskid surface for passenger safety. Passenger space has been maximized up front thanks to a pickle-fork bow design that carries the beam far forward. Starcraft wisely kept the walkway to the forward deck narrow, to increase seating capacity. Thanks to a pair of standard filler cushions, the forward section is convertible; with the cushions in place, it forms a pair of forward-facing recliners, but with them removed, two couples can sit facing each other with their feet on the deck. 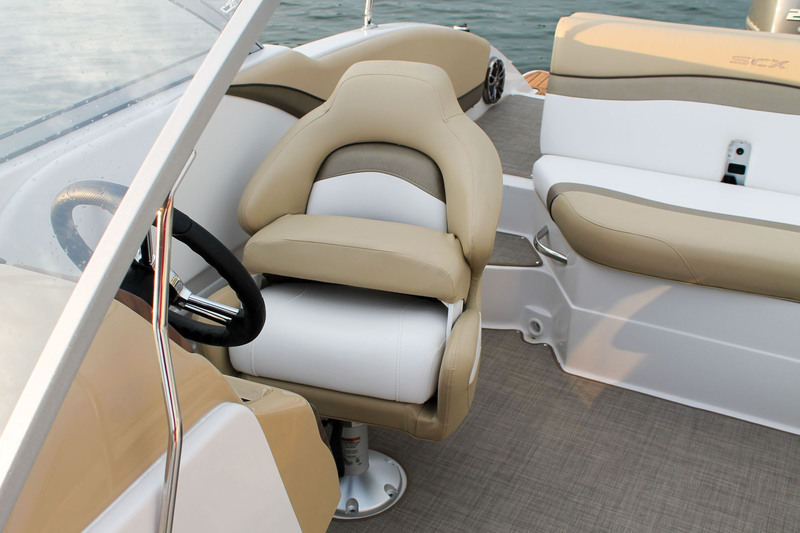 Whether sitting or reclining, you feel safe thanks to the high gunwales. Powering our test boat was the Yamaha F250XA, which is the older-gen 3.3L V-6. The newer Offshore F250 has a “big bore” 4.2L powerhead and weighs 48 pounds less, at 562 pounds, but it also costs several thousand dollars more. Yamaha still makes both engines, and the smaller-displacement model performed well. Our test boat had the optional towing package and was clearly propped for power rather than top speed, as is often the case when we get a boat for testing. Out of the hole, the SCX 230 had a fair amount of bowrise, which is pretty common on boats with brackets, since the center of gravity is moved farther aft, but the bow came down quickly and it began to plane in only 2.3 seconds. And while the Offshore F250 model has better acceleration, the F250XA is no slouch and pushed the solidly built 3,550-pound, 22-foot, 10-inch hull to 30 mph in 7 seconds. Top speed pegged out at 43 mph as our tachometer showed an alarming 8000 rpm, clearly a gauge issue, since this Yamaha tops out at 6000 rpm. Yamaha’s Performance Bulletin on this boat revealed that its test boat had the same engine but reached 53.5 mph, more than 10 mph faster, but was more than 3.5 seconds slower to 30 mph, lending credence to my power prop theory. The SCX 230 features a dihedral V hull that has aggressively large outer reverse chines that increase flotation and side-to-side stability. At the hull’s entry, it’s sharp enough to slice easily through the waves, and the keel on this design protrudes farther down than on most boats and multiplies the slicing ability while enhancing directional control. Vents in the reverse chines introduce air beneath the hull to reduce surface tension and improve performance. When running, the SCX 230 rides high in the water, making its draft shallower than on most other boats of its size and weight. With the flotation pushed farther outward, it doesn’t heel over alarmingly during a hard turn. The only quirk of the bracket setup is the stern squats a bit when the throttle is suddenly pulled back, and the engine gets a free bath. Max passenger capacity on the boat is 13 people, and in addition to the roomy bow section you have a companion bucket seat and an L-lounge in the cockpit. (Curiously, the 26-foot-long SCX 250 OB flagship of the SCX family has the same passenger capacity.) For an easy transition to and from the stern, there’s a starboard-side walkthough that conceals an Igloo Marine cooler, and just behind the captain is an entertainment center with plenty of room for snack and beverage construction. Our model had the optional freshwater sink. Our test boat was rigged with the Tow Package, making it ready for watersports while adding some attitude. 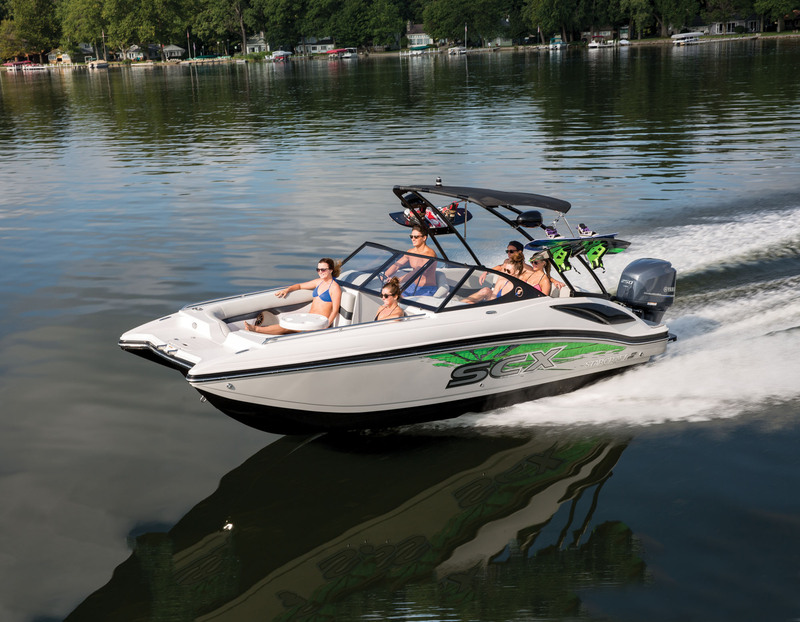 The package features a forward-swept black aluminum watersports tower that has an integrated Bimini and speakers, board racks and a rearview mirror. The centerline locker is huge and can accept any overflow once the racks are filled. The SCX 230 OB puts out a nice little jumping wake at around 20 mph, but it flattened out when we approached slalom speeds, making it a good all-around recreational ski boat. You can even order a fishing package that includes a pedestal seat on the large bow deck, as well as a livewell. The forward deck also comes with a combo boarding ladder/anchor locker. 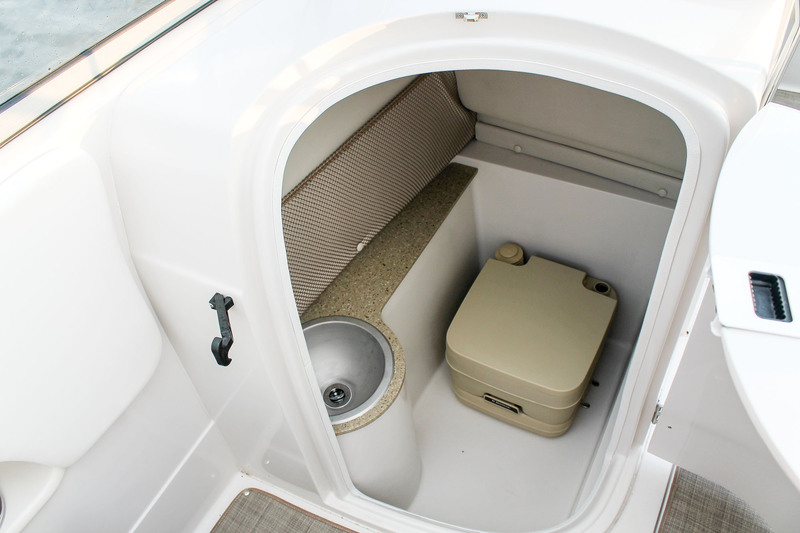 There’s a comprehensive set of standard features, including the huge port-side head compartment with a Dometic portable toilet (no pumpout option, though) and a freshwater sink. If a head compartment isn’t high on the must-have list, consider buying the SCX 231 OB, which doesn’t have the full-beam windshield and has no starboard-side console, replacing it with more seating. Tilt SeaStar steering and a Bimini top also come standard on both models. 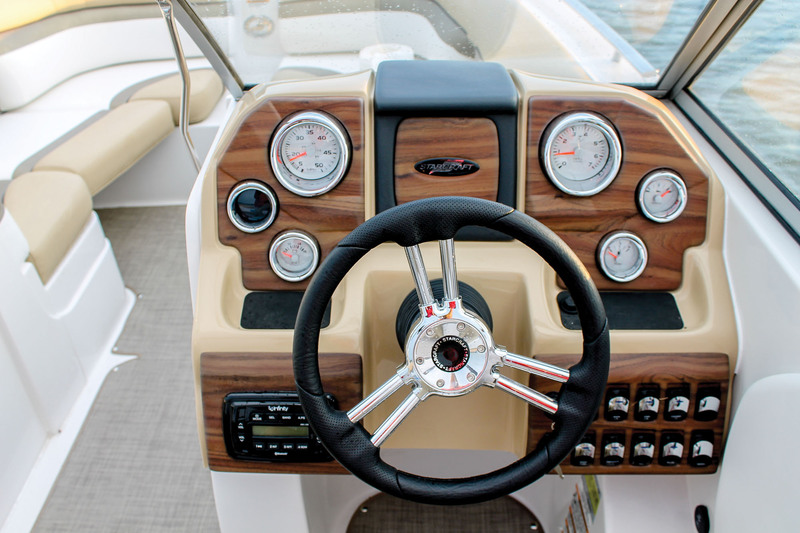 Our boat had the LS package, which waves the bling wand with features such as snap-in carpeting, lighted cupholders and speakers, two stern speakers, a stereo control pad, a transom shower and underwater lighting. Although the standard, yet upscale, Infinity stereo system our boat had was pretty good, the Premium Package includes Polk Audio components such as a subwoofer, speakers, an amp and a Sirius-ready head unit. Other must-have options include a choice of 11 color combos for a custom look and snap-in Sea Weave vinyl flooring. Purchased by Rich and Sara Nestro, plus Laila, 5, and Kaia, 1, Jupiter, Fla. Purchased at The Boat Kings, Pompano Beach, Fla.
We are thinking of adding a wakeboard tower. I used to boat with my dad when I was younger but stopped boating when I moved to places in California and Texas where we weren’t close to good boating. But when we moved to Jupiter, on Florida’s east coast, I wanted to get back into it. We had a sterndrive boat for a few years but realized an outboard-powered boat was better suited to the area. I started looking at used boats but realized for a little extra I could get a new boat. We wanted something roomy for guests, and with two young girls we needed a boat with a head compartment. The Starcraft SCX 230 OB is perfect for our lifestyle; it’s really family friendly. It’s fast to get on plane and handles well. I like having something I can take out in the ocean and anchor off the beach or go to Peanut Island where everyone hangs out. I like to ski, Laila likes to go tubing and we like to go to one of the many waterfront restaurants in our area, such as the PGA Marina or U-Tiki on the Loxahatchee River. Tommy, our salesman at The Boat Kings, was straightforward and upfront during our negotiations, and I think we got a fair deal. LOA: 22 ft., 10 in.